Eric Goodman's new novel, Womb, reveals how easily life can be lost and, just as easily, how life can be celebrated. Penny is reluctant to tell her husband, Jack, that she's pregnant. With dead-end jobs and unfulfilled lives, she believes that they're not ready to support a child. When Jack finds out the truth about their child's conception, Penny must reevaluate the priorities in her life. With unpredictable twists and thought-provoking fetus commentary, the narrator shares his bumpy journey to birth from the all-knowing perspective of the womb. 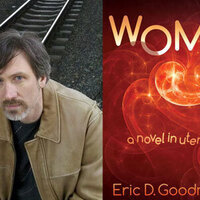 Eric D. Goodman is the author of Tracks: A Novel in Stories and the children's book, Flightless Goose. His short fiction, travel stories, and nonfiction have been widely published. A California native, Goodman has lived in Baltimore for nearly 20 years. Gregg Wilhelm, founder of CityLit Project, will introduce the event.